Called the day before checkin to confirm my reservation. Showed me my storage unit prior to signing to make sure it would be ok. Very good customer service! Nice place, excellent customer service, good price. Only con is that I would have prefer metal door for the storage place. The. Staff was very helpful. they went out of thete esy to help me. Great option for college summer storage! Staff was very helpful and responsive. Paperwork was easy. The unit is great and seems like all my stuff will be safe. The truck made a huge difference. Customer service was top rate! The truck is a real bonus! 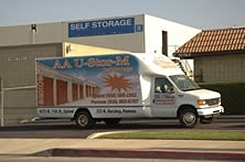 We would recommend this storage company. It is clean and the site is visually monitored giving a sense of security. The customer service was friendly and helpful. Staff makes me regret renting. If it wasn't for the deal on the first month, I would have never rented from here. I can't wait to find a storage that's respectful to my trade and doesn't judge by my appearance or interrogate my profession. The facility meet my need. 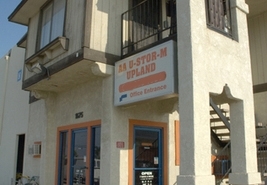 The location seems safe and the staff is helpful and friendly. I did recommend a unit at this location for my father too! Very Friendly Staff, clean facility. Very easy transaction, great service. Great customer service. Clean unit. Easy transaction. Great place to store your belonging and great customer service! Awesome staff in a convenient area. I really enjoyed my check-in time with the staff. They were knowledgeable, friendly, and very helpful. The location is in a good area and it is gated as well. So far, so good!!! Working with Sparefoot was great and the storage facility we selected has also been easy to work with. The pricing is a bit high, but thankfully we got the first month free using our AAA discount. Customer service agent was very helpful and knowledgeable. Like the fact that I got one month free. I will tell my friends and family about the services. The one free month. The place was clean. Get your money worth. This is a great place for your storage. It's clean, safe and the customer service is outstanding!! This facility was really friendly and helpful. Also they provided coffee and hot chocolate for my wife and kids. I really like their curtesy and attention with my family. GREAT CUSTOMER SERVICE!! Took the time to show me different units and locations to find the "perfect" size and location - lots of options. We moved into the unit on our wedding anniversary and the front desk staff gave us "His/Her" bottles of water decorated in blue/pink. A light bulb was out in our unit, I informed the front desk and when we came back with our 2nd load they were ready with a bulb and changed it out the moment we arrived. The staff are friendly, efficient and very thoughtful!!!! Great access hours! Price is right! Safe location, clean facility. This is a GREAT place...I never thought I'd feel so strongly about a storage facility...but I do!! !